« Braj » or how to celebrate Spring the Algerian way……Braj…..ou comment celebrer le printemps a l’Algerienne…..
From the dawn of history, Spring has always been a symbol of hope and rebirth ,a time to celebrate the return of light and warmth, and new crop planting after months of harsh and tiring weather . Ancient civilizations like the Egyptians with their “ cham enissim” or Persian “and their “noruz” celebrated the return of spring with house cleaning, picnicking and the preparation of a given food typical to each culture…..
Algeria, whose history has mingled with all its neighboring mediterranean civilizations , is no exception. Even though the celebration has no official status, people of the eastern part of the country continue to celebrate the coming of spring that falls on the beginning of March according to the crop- based ,Amazigh calendar. 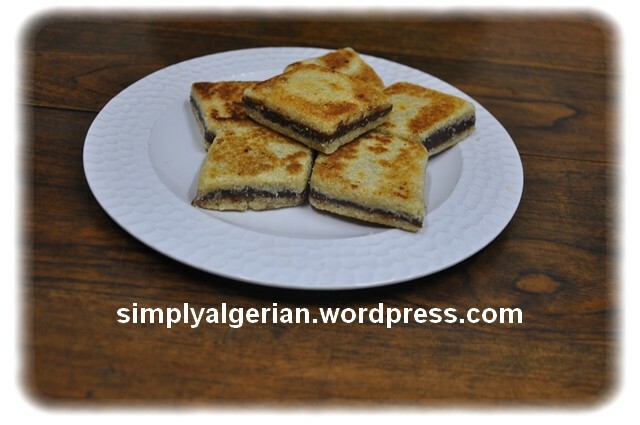 the term braj, means losange in Algerian dialect. 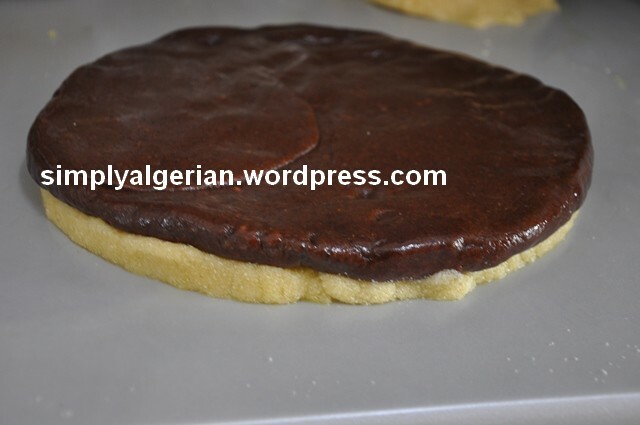 until a near past, this was the favourite shape of Algerians, every thing edible would be cut into a losange or a diamond shape… makroud, rfiss, braj, watermelon, even baklawa, tthe worlwide turkish delicacy is cut into lozanges. this opssession with the shape go beyond food and can be extended into jewelery , carpet , potery drawings and even to the tatoos worn by elderly women …… I am not a sociologist nor a historian but I dare think it’s one of the infuences of Amazigh culture …. 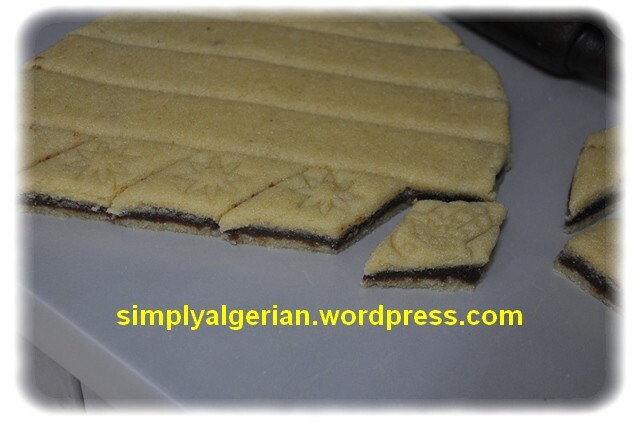 nowedays, the spell of the diamond shape has been broken in pastry giving birth to tens of new cookies with different shapes and forms……. FILLING:: I can’t give you an exact amount since the quantity used depends on the amount of date you want to have in the cake. I personnally like to have a generous layer of date paste . 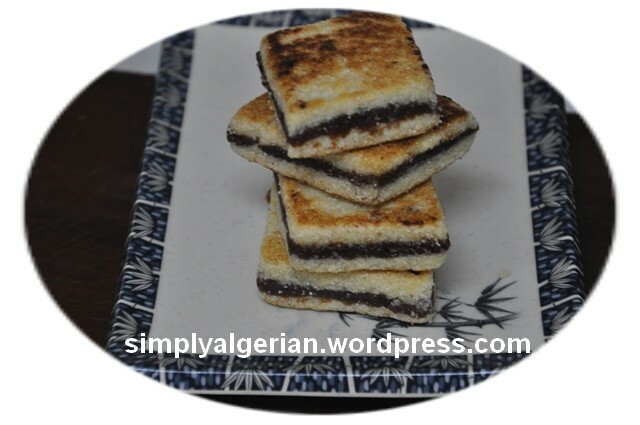 mix the semoulina with the melted and cooled ghee, add the pinch salt, rub it with the palm of your hands as you would do with makroud, so that the ghee gets fully incorporated by the semoulina. leave the mixture to stand for few hours. 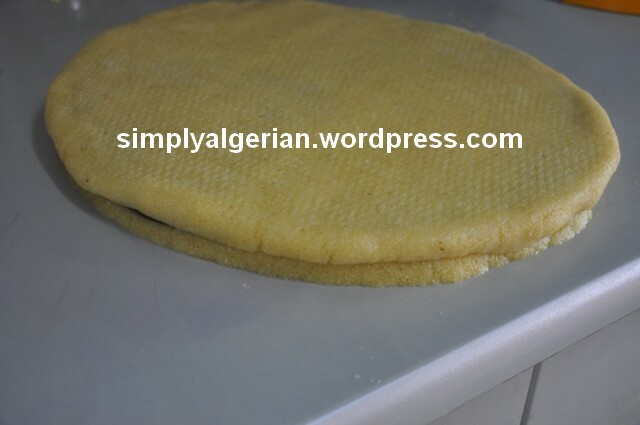 •Gradually add the orange blossom water and the water mixture until you get nice dough , neither dry, nor too soft. let it stand for half an hour. in the meantime, knead the date paste with cinammon and oil, if you fancy, add a spoonful of toasted sesamy seeds. 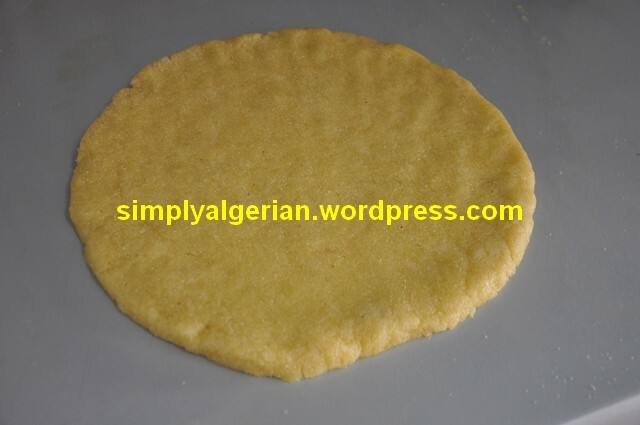 divide the semoulina dough into two equal balls . 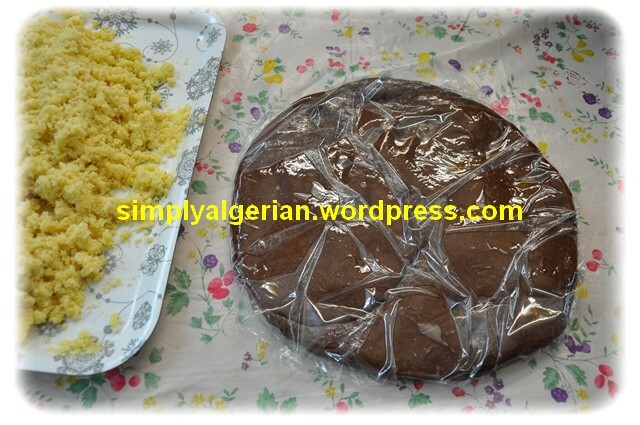 flatten one of the semoulina balls, place the date paste on top and cover it with the remaining semoulina ball. flatten this sandwich cake with a rolling pin . 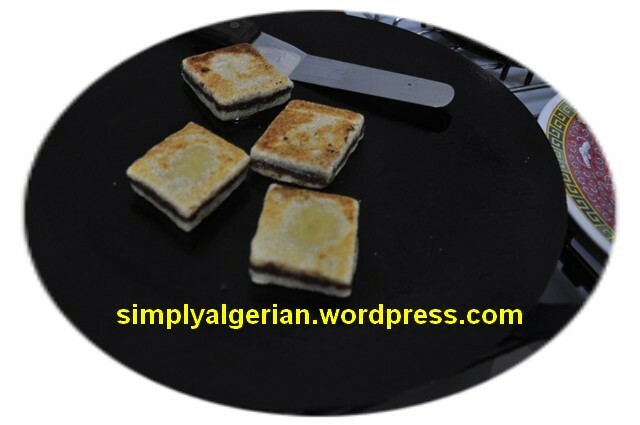 cut into losanges or squares and cook on a low-heated, un-greased « tajine » or » mraa » returning both sides with a spatula until they get a nice golden brown colour. melanger la semoule,le sel,et le beurre fondu.bien travailler en frottant entre les mains.ajouter progressivement le melange eau et fleur d’oranger, jusqu’a l’obtention d’une pate maniable.deviser la en deux boules identiques. entre temps,mettre un grand sachet ou un papier film sur la table de travail,, huiler le legerement,deposez la pate de datte dessus et l’aplatissez en formant un cercle d’environ 1,5cm de diametre. prendre une boule de pate,l’abaissez en formant une grande galette.soulever le sachet et deposez dessus la pate de datte .
. etaler la galette avec le rouleau a patisserie ou la paume de la main .couper la galette en bandes dans le sens de la largeur ,pour faire des losanges . faire chauffer le tajine ou la poele , diminuer le feu .faites cuire les losanges sur les deux faces ,et degustez avec l’ben. 8 Commentaires Publié dansAlgerian pastry Taguébraj, date paste, ghars, pate de date, printemps, spring.